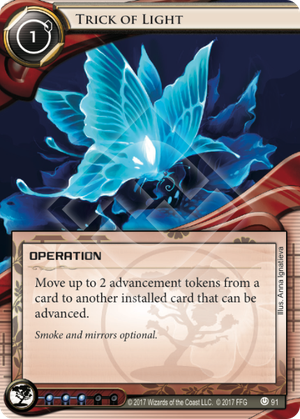 This is the Jinteki Fast Advance card, and it is only good if there is a place to bank those advancement tokens. Advanceable ICE for instance, is a great place to put them, and it helps relieve some of the tempo sting of advancing agendas. Scoring an agenda naturally requires time and money (clicks and credits), which means that every time the corp does so, tempo is being lost. Nothing is being done on that turn except setting up the chance to score, and if it is not fast advanced, then setting up the chance for the runner to steal as well. Trick of Light alleviates some of that. Not only is it a Fast Advance strategy, allowing a three for two to be scored out in one turn (even a four for two), the process of putting tokens on advanceable ICE to save them for later spreads the tempo hit out over multiple turns to score an agenda, instead of all at once. It may not be the strongest of the Fast Advance core strategy cards, but it still has some uses and will still see play. This is a great card. It can be used to score a 3/2 from hand. Lets compare to other Fast Advance cards. Biotic Labor: A really good card but expensive, not only in credits but influence if played out of faction. You can score that 3/2 from hand but it'll cost you 7 credits between the play cost and the advances to score the agenda. Be careful using it with only 7 or 8 credits in your pool as even a poor runner may be able to take advantage of your "broke" state afterwards. Also, in order to score from hand you have to play this before the second advancement opening a window for a Clot install. SanSan City Grid: An amazing card. Even more costly than Biotic Labor at first and it needs to be installed on a previous turn, but it can be used repeatedly. It'll cost you 8 on your first 3/2 that you score from hand but only 2 each afterwards if you manage to keep it alive. Put this behind a Tollbooth and it'll be crazy expensive for the runner to trash. As a runner I always like to wait to trash stuff like Pad Campaign until the Corp rezzes it so that at least they have lost some money on it. But failing to trash this card when you first access it can lose you the game. It's just so expensive to trash! I'm glad it is on the MWL. There are other ways to score from hand but they require a bit of a combo, so I'll move on to this card. Trick of Light: This card takes a bit of set up. You need to have 2 advancement tokens on another card. Advance-able ice is a good pick. It'll cost you 2 clicks and 2 credits but those advancements may well help you tax the runner in the meantime. Watch out for ice destruction though! Use with Tennin Institute: The Secrets Within and you could get some free advancements, and they can be on any ice, they don't even need to be advance-able (try with Woodcutter just for fun). Use with Weyland Consortium: Because We Built It to cover the credit cost of the advances. Or put the advancements on a trap. If they run at it, yeaaa, hurt the runner. If not, you've got your set up for Trick of Light. I like to use Mushin No Shin to set up the trap. It'll save you money, make the trap more potent, and keep a token on the card after the Trick of Light. Otherwise the runner may decide to run and trash it after your Trick of Light just to get rid of your token platform. Another thing worth mentioning is the Clot interaction. It's generally an easy call for the runner when the Corp plays a Biotic Labor, or advances a card on a rezzed San San, whether they should install their Clot or not. But with Trick of Light, they need to decide after the first advancement token whether or not they want to install it. If they decide not to, then the Corp can score it after the Trick of Light; there is no additional window for the runner. Also consider the cost. You only need 2 credits to score an agenda with this card. That's amazing late game as you may be rezzing all your ice to keep the runner out. Even if you count the 2 credits you may of spent advancing a card previously, 4 credits is cheap for the ability to score an agenda out of hand. All in all a great card. 3 influence is high, but not as high as other fast advance cards, so you'll see this in other decks, especially BWBI.